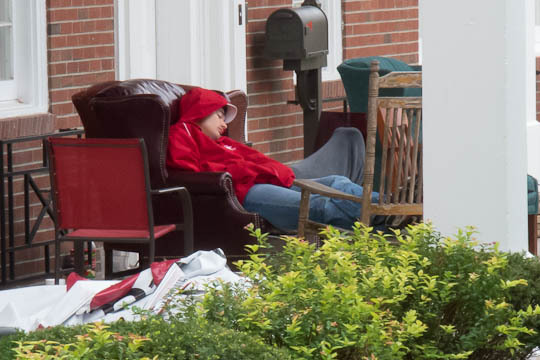 The college had a lot to celebrate over Homecoming. A big item was the completion of the Challenge of Excellence almost a year early and at over $68,000,000 – $8,000,000 above the goal for June 2013!!! A lot of people were praised over the weekend for this great result. From the Grunge’s perspective though, we didn’t acknowledge and thank one of the main drivers – Alison Kothe – nearly enough. October 2010 – Campaign announced and quiet phase had generated a total of over $36,000,000. Fall 2011 – the college decided to accelerate the completion of the campaign looking at the upcoming elections and fears of their impact on the economy. October 2011 – The COE stood at $44,700,000. 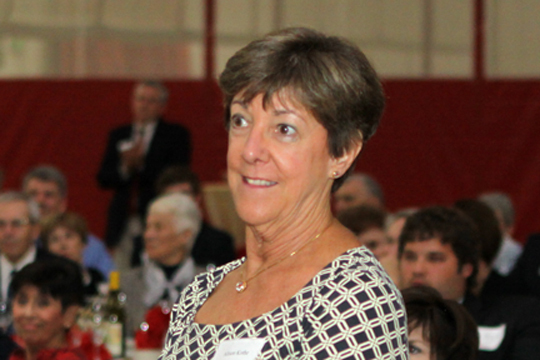 December 2011 – Alison took over the staff leadership of the COE and agreed to delay her retirement to lead the effort. September 2012 – COE at over $68,000,000 – up over $23,000,000 in less than a year. Well over 95% of the increase was the result of the staff’s efforts. And “oh, by the way”: Largest gift to the college in that timeframe was cultivated by…Alison Kothe. It was Alison’s vision, leadership, drive, and personal dedication that motivated the staff to achieve. She modeled dedicated, over-the-top performance. Thanks, Alison. Those of us who have the pleasure of working beside you know how hard you’ve worked and how much you have done. David Wagner will be honored as an Alumni Admissions Fellow tomorrow at the annual Alumni Chapel. David is a teacher and coach in the Rio Grand Valley area of Texas. He’s receiving the award because of his efforts in linking young men of promise with Wabash. As you can imagine, this isn’t the time of year that David could take time off from school and travel to C’ville. We were able to do the next best thing. Chip Timmons, Associate Director of Admissions, was scheduled to be in the area this week AND David’s school was holding a convocation. 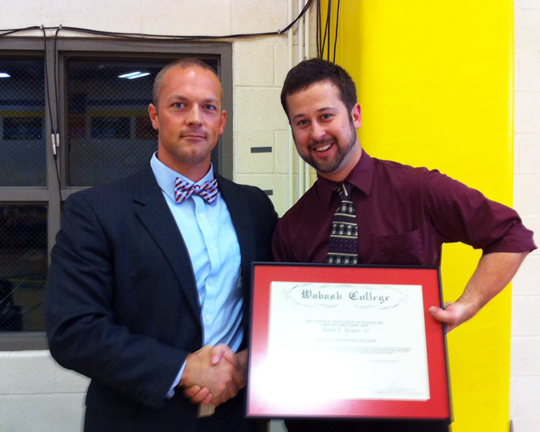 Chip was able to present the award to David in front of many faculty and students. I think that’s a win-win-win. Thanks David for all you do for Wabash! You’re Some Little Giant! I stopped by the Senior Bench yesterday afternoon. Thought I had seen some activity. These guys are independents and they are staking out the bench for a painting tonight. They were all working on computers or reading books. Looked serious enough to me. Didn’t see the paint cans so not quite sure what the paint scheme will be. Another one is in the books. 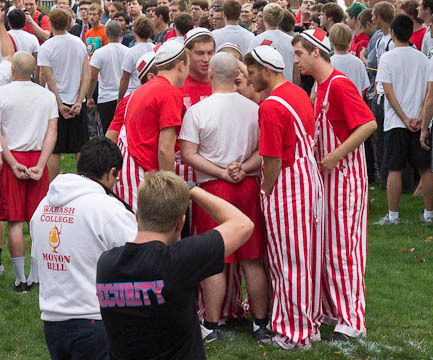 It’s always fun…but it reminds me that they walk in Wabash Freshmen and they walk away Wabash Men. That’s the critical part – the rite of passage. Took a few photos – click here and here. An early stroll across campus gave me a chance to see how Chapel Sing preparations were coming along. 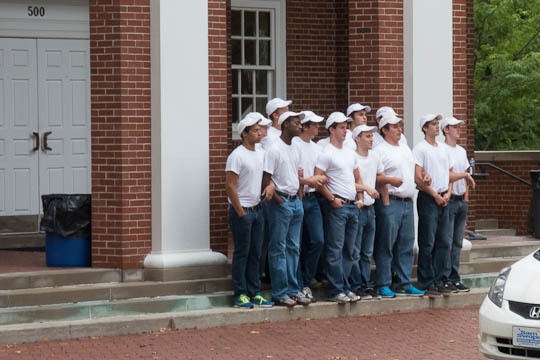 As is the tradition, the Betas are holding down the Chapel steps preparing for the Sing. It’s cool…they are in t-shirts…sure hope there’s brain food/hot drinks on the way! Of course another part of the effort for Homecoming is float building. Caught this young man contemplating the next part of the float construction process. There’s actually a pile of lumber on their front lawn – they are well ahead of the game! How long will this paint job last? Several TKE alumni were back on campus last weekend to celebrate the 50th anniversary of the Wabash Chapter reappearing on campus. 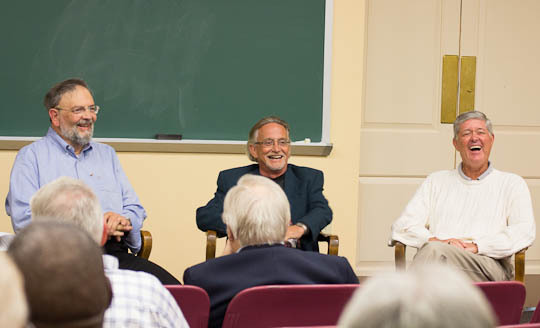 The three men above took part in a panel that talk about the “early” days. Professor Eric Dean’s name came up in every paragraph as a guiding hand and mentor. The story begins with a strong friendship – one man, a member of a fraternity, wants his friend to have the same opportunity. But the fraternities were not integrated back then. A classic situation – wait for things to change or make a difference and change them. “A” was the easiest answer – “B” was the choice! And so a group of Wabash men brought TKE back to life. Fully integrated and full of opportunity. It took guts, vision, and determination…a Wabash profile in courage. Andy Ford H’03 In The House! 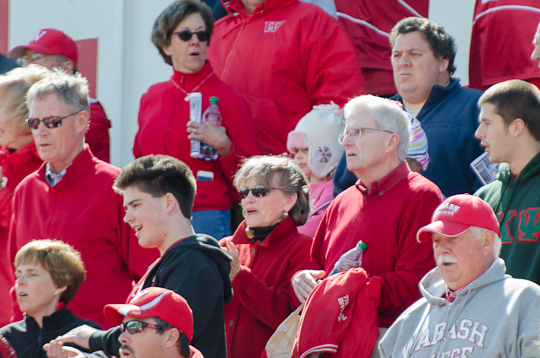 It was great to see President Ford back on campus last weekend for the Allegheny game. I never got the chance to catch up with Andy – he always had a crowd around him! Andy had some time to talk with John Goodrich ’67 whose generous gifts to the college have supported many areas. More on that in an upcoming blog. 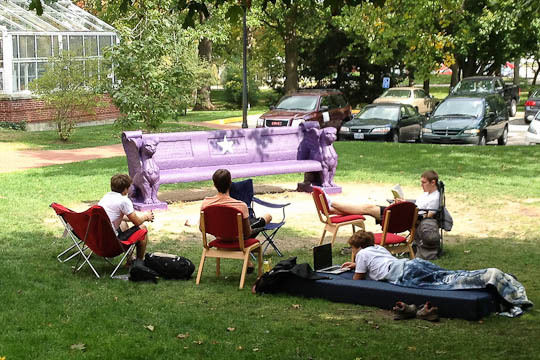 Adam Miller ’12 took the less than normally traveled, post Wabash route. 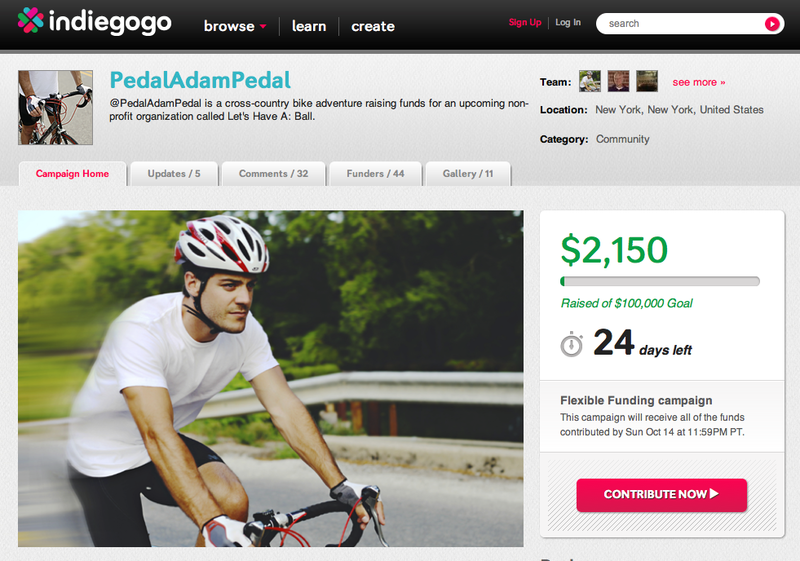 He’s riding across America as a Gentleman and Responsible Citizen. Want to learn more? Just click here. Administrative note: The Grunge is about to pick up additional administrative support duties. When that happens, there just won’t be time for the Grunge Report. Please search our web site for other blogs about Wabash. The Grunge recommends this one and these. I Love This! Get on Linkedin!!! The Grunge received this on Linkedin. It demonstrates the utility of Linkedin…and the quality of our guys. Chris Schroll has sent you a message. In August I posted a discussion, saying I was searching for a Market Research Manager. Within a couple days I got a response from a Wabash alumnus (Class of 1998). This alumnus was head and shoulders above the other candidates, and we fast tracked him into our organization. He’s finishing his second week here, and already showing his quality. Just wanted to share this success story about using the LinkedIn group for recruiting purposes. I’m looking forward a long and successful collaboration with this Little Giant Mark, and to learning from him as he contributes to Wolters Kluwer. 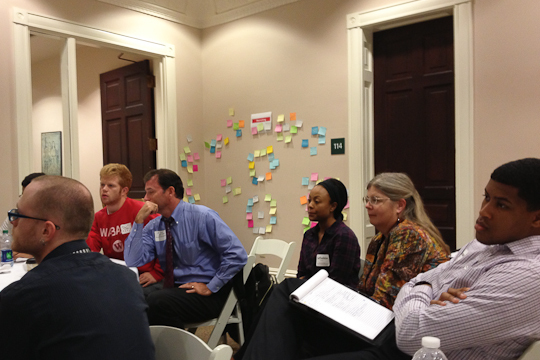 Last night over 60 faculty, staff, alumni, and students gathered for a workshop on inclusiveness and diversity at Wabash. It was interesting and informative. We have work to do, as they say. The workshop leaders were Rob Shook ’83 and his fellow IBM employee Bill Kirst. They are exceptional at getting a group involved and motivated. They created an inclusive environment, free from any criticism, and left people to explore new and different ideas. 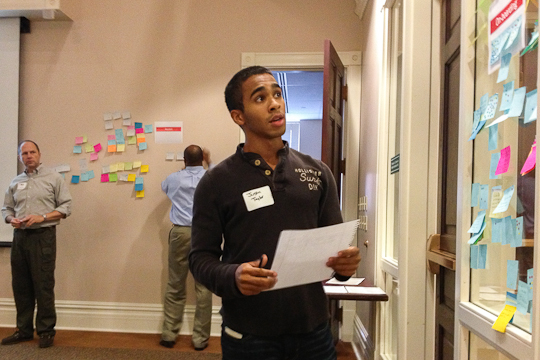 One of the breakout sessions with ideas (Sticky Notes) on the wall in the background. President Pat White reviewed the findings with the group near the end and found the work to be beneficial as the college moves forward. Fun…informative…productive…I think that equals time well spent for individuals and for Wabash.